The kitchen, often considered the heart of the home, is a natural gathering place for families. So, if you are thinking of selling your home, it is important to ensure that your kitchen is resale-ready. Don’t get nervous! This does not mean that you need to consider a full kitchen remodel. Cabinet refacing, updating finishes, a fresh paint job and a few other minor tweaks could do the job. According to Remodeling Magazine, a minor kitchen remodel will recoup about 80 percent of its cost, while a major midrange kitchen remodel will see only around a 65 percent return on investment. Good news for the minor updates! Dedicated kitchen remodelers, such as Desirable Kitchens & Refacing in Pittsburgh, PA, work with you to find the most cost effective and time efficient way to upgrade your kitchen, while adding resale value to your home. In order to get your kitchen ready to put your home on the market, there are six important tips to consider. Research your neighborhood and area – Research homes in your neighborhood by looking online or talking to local realtors to see what the kitchen must-haves are for your area. They will be able to provide you with the pros and cons of various upgrades, as well as identify those kitchen features currently being marketed and attracting buyers. Avoid overly personalizing – When choosing items to remodel for resale, consider upgrades that appeal to the masses. You want to stick with simple style schemes and décor. A unique décor accessory, whether it is lighting or personalized drawer pulls, may seem perfect for your taste, but may turn off a potential buyer. Paint – Choosing a new color to wash your walls is an inexpensive upgrade that will transform the look of your kitchen. Stick to a neutral, simple shade. Consider using natural paint or paint with low-VOC or no VOC, which makes your kitchen more eco-friendly, and reduces the amount of toxins that can potentially be released in the air. Reface your kitchen cabinets – If your cabinets are in good condition, there is no need to tear them out and replace with new ones. Upgrading the doors, trim, color, and hardware with cabinet refacing is quicker and less expensive than a full kitchen remodel. It allows you to keep your current kitchen intact, while completely transforming its appearance. Upgrade countertops – Buyers are looking for durable, solid, beautiful countertops. Granite has become a standard in many homes today. So, if you still have dated laminate countertops, you may want to consider spending the extra money to upgrade. Quartz countertops are also becoming a wanted item. Stage the area – Potential buyers want to imagine themselves living in your home. In order to help them visualize this, be sure to stage your kitchen well. Be sure it is clutter free and kept clean at all times. This includes your pantry and cupboards, which an interested buyer will most likely open. Be sure there is an easy flow to the kitchen with regards to tables, chairs and any other moveable items. Decorate with fresh flowers or fruit to present a cozy, lived in space. Don’t underestimate the value of a newly upgraded kitchen. Give your kitchen the attention it needs before placing your home on the market. Desirable Kitchens & Refacing, located in the South Hills of Pittsburgh, PA, works closely with you to determine the best options to upgrade your kitchen for resale. For years, they have been transforming kitchens in western PA with customers’ needs always first. 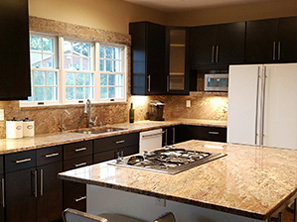 From cabinet refacing to granite countertops to flooring installation, the team at Desirable Kitchens & Refacing has the right solution for every customer – every time! For a free consultation or more information, call 412-515-0582 or visit http://www.pittsburghdesirablekitchens.com.